David Collin sailed Speedwell from Kirkcudbright to the Isle of Man in July 2001 to take part in the Manx Traditional Boat Festival, this is a report of the voyage. 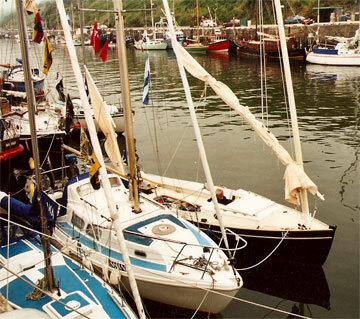 The eleventh annual Manx Traditional Boat Festival took place at Peel, Isle of Man, from 5th to 8th July 2001. Fifty-nine vessels registered for the event, from Manx ports, as well as from English, Welsh, Irish, Northern Irish, and Scottish ones. The vessels varied greatly in size, age, and type, the largest being the 80 ft Lowestoft sailing ex-beam trawler Keewaydin, and the joint oldest being the Morecambe Bay Prawner Arthur Alexander and the gaff cutter Leonora, which were both built in 1894. 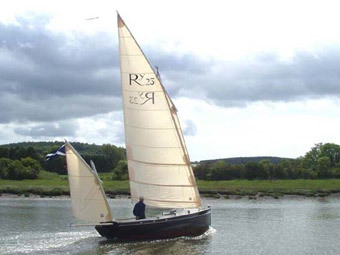 The distinction of being both the youngest, and the smallest vessel to make the passage to the Isle of Man went to Speedwell of Kirkcudbright, a standing lug rigged yawl of only 22 ft. in length which was launched in the late summer of 2000. Her construction was completed by David Collin, from a kit supplied by the Bridgend Boat Company of Plymouth. Speedwell was skippered by her owner David Collin, and crewed by his son Alastair Collin and another Kirkcudbright mariner, Alastair Murray. Speedwell lived up to her name, making a good passage of four and a half hours from Little Ross Island to the Point of Ayre on 5th July, despite a forty five minute period in which the Northerly force 3 wind died away to nothing. During that period, suntan lotion was liberally applied and a porpoise was sighted. After the Point of Ayre at the northern end of the Isle of Man was abeam, contrary tides resulted in a further five and a half hours of sailing through fairly confused seas until arrival at Peel, at the south west end of the island as darkness fell. Legendary Manx hospitality exceeded all our expectations, and included free meals for all participating crews, with a breakfast of fresh bread, butter, milk, cheese and kippers delivered to each vessel. A full programme of entertainment included racing, theatre, traditional music, and the burning of a Viking longboat after a torch-lit procession along the shore, to the accompaniment of fireworks. Speedwell’s accommodation is minimal, so while one crewman managed to find space to recline on a cockpit bench, the other elected to sleep on shore in a waterproof sleeping bag. He found a convenient spot on Peel hill, beside the castle, where he was licked into wakefulness each morning by friendly Manx dogs. The skipper exercised his power and claimed the only berth that was not filled with clothing and equipment. Adverse weather forecasts and discussion with the Coastguards dictated a rapid departure on 8th July in a freshening Southerly wind, in a bid to get home before the weather worsened. 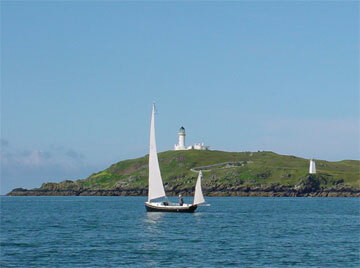 Speedwell kept her decks and her crew dry despite a close encounter with the giant wash of a Seacat ferry, and was tucked neatly behind Little Ross Island at the mouth of Kirkcudbright Bay as the wind mounted to force 5 or 6. Speedwell’s performance was a credit to her designer Nigel Irens, who devised the concept of taking the hull and rig of a traditional Scottish vessel, and applying current technology to enhance stability, strength and performance. Speedwell’s carbon fibre un-stayed masts, and 50% ballast ratio may not be strictly traditional, but they gave the crew great confidence in her seaworthiness during their 100 mile round trip across the North Irish Sea. I entered Peel harbour, Isle of Man, as darkness fell in a nasty cross sea, after a forty-five mile passage from Kirkcudbright. A few days later, when trying to leave Peel I discovered that the centreboard would not go down. I returned to Peel where very helpful local people mustered a power hose, a shipwright and a marine engineer. Despite their efforts the problem continued and I was forced to sail home with the centreboard firmly jammed in the fully raised position. A call to Bridgend Boats quickly established that I was not the only person to have had this problem. Apparently, the boats built by Dartington had a polycarbonate washer/spacer on either side of the centreboard, between it and the sides of the pivot housing. Some boats built by Brigdend did not have this fitted as it was not considered necessary. Without those spacers, the centreboard could slide across the pivot bolt in a heavy cross sea. The whole mechanism is so neatly engineered that that would then cause the plate to jam against one side or the other while being raised. Bridgend sent me the necessary washers and it was an easy job to put them in while the boat was on the trailer and the plate was supported by a car-jack.